1. Surely you must remember the network that brought us this awesome tale of awesome awesomeness, right? Right?? 9. Do you remember the name of the hurricane that's a-brewing? 11. Who kills a shark when it comes through the window of the bar? 14. During the attack on the April's house, who wields a shotgun? 18. I know....let's nuke the sharks from the air! Who first comes up with firing bombs at the sharks? 19. 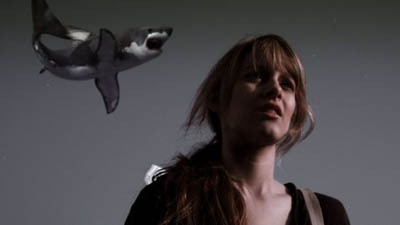 Nova relates the terrible tragic story of losing which of her loved ones to a shark? 20. Who take to the air in a helicopter to fight the sharks?